Join us October 19th at 7:00 P.M. at the Ross Pendergraft Library as we welcome special guest Dr. Stanley Lombardo, professor of English at Arkansas Tech, to give a presentation entitled, “World War I Influence on American Literature, Painting, Photography, and Film.” This free event will take place in RPL 300B–all are welcome. 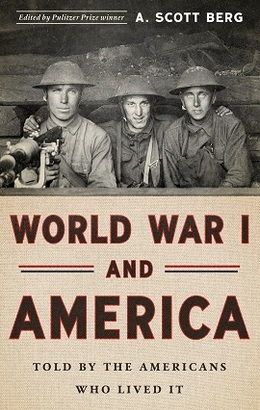 Dr. Lombardo will be reading from the book, World War I and America: Told By the Americans Who Lived It, a publication from the Library of America. In particular, he will discuss the war’s impact on American culture, particularly its influence on writers, painters, photographers, and filmmakers. Attendees will be treated to a short reading from Ernest Hemingway’s story, “Soldier’s Home,” film clips from the movie The Big Parade (1925), as well as a discussion on some of the embedded artists of World War I and other American artists of the time. In addition, Dr. Lombardo will also explore the post-war trend toward horror films using James Whale’s Frankenstein (1931) as an example of how the war shaped filmmakers conception of horror. The presentation is the latest in a special series which will run through November, featuring guest lectures and a first floor display commemorating the World War I Centennial. The last presentation in the series will occur on November 9th and will feature an all veterans appreciation event and discussion panel on veteran’s issues.